Wars leave behind memories which erode quickly and memorials which do not. Hindsight, age and revisionism can change memories but the memorials are fixed. They are guides to how a nation wished to remember a war. Deeply political testaments to why nations fought and what they think came out of it. There are 28 military cemeteries in Normandy. Sixteen for British & Commonwealth troops, two American, two Canadian, one Polish, six German and one French. 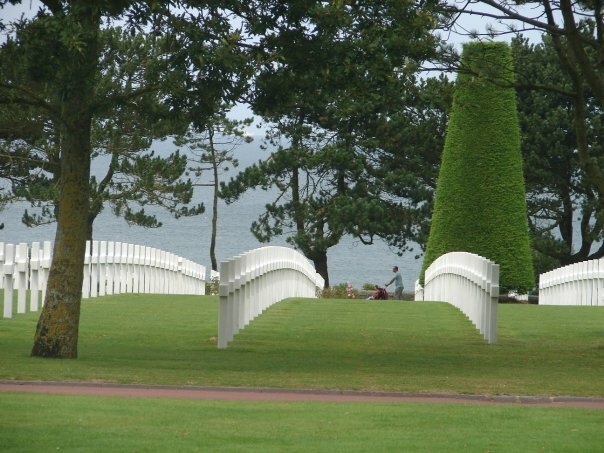 Probably the best known is the American Cemetery and Memorial at Omaha Beach in Colleville-sur-Mer, featured in the opening and closing scenes of Saving Private Ryan. It is located just yards from Omaha Beach, one of three American landing areas in the D-Day invasion. The battle there particularly fierce and accounted for close to half of the nearly 6,000 Americans killed, wounded, missing or captured that day. Today it is difficult to imagine a battle here. The German fortifications have been removed and the craters filled in. It is now home to a tranquil, respectful tribute to the battle and the Americans who died in the war. The 172 acres of the site hold a museum, a large memorial and the graves of 9,387 American men and women, most of who died during D-Day. The museum tells the story of some of the people who died there and why the battle and the war were fought with the expected respectful tone. While some special attention is given to Gen. Eisenhower who commanded the invasion, the troops are the primary focus. The museum provides a database to look up the names of people buried here and where their graves are located. From the museum you follow a walkway which runs along the top of bluffs and overlooks a wide, beautiful beach. It is a serene view with dense, green shrubbery running down the bluffs and ending at a wide, sandy shore. This is where the bulk of fighting took place. Two paved paths offer an easy way to get quickly from the heights to the beach. Nothing about it suggests men trying to climb those bluffs as other men fired down on them. Continue past this vista and you come to what has been formally designated as the memorial. It consists of a semicircular colonnade with open structures – loggias – at either end. The colonnade is a cenotaph, inscribed with the names of 1,557 Americans military personnel whose remains have never been found. The loggias hold maps and narratives of the military operations. The maps, with their large red arrows showing the movement of troops, seem out of place as does much of the memorial’s other adornment. The narratives are almost boiler plate descriptions of large unit actions. At the center is a bronze statue entitled Spirit of American Youth done in can only be described as the heroic WPA/socialist realist style. All of it is superfluous. Look west from the memorial and you see why. Across a reflecting pool are row upon row upon row of headstones. The graves, marked by crosses and the occasional Star of David, are perfectly aligned – as if still in military formation. Kneel directly in front of one and the gravestones seem to continue into infinity, like the view when two mirrors are held up to each other. The layout of the cemetery emphasizes number of dead more than the person each marker stands for. The sheer number of people killed in war poses a problem for anyone wanting to design a memorial. “One death is a tragedy, a million is a statistic,” said Stalin, who used this fact to obscure his own acts. That horrible math holds true here. Among thousands of graves the individual’s death is subsumed into the anonymity of the group. It is easy to be awed by the number of dead without feeling the grief which comes from the loss of one person you actually know. Despite 9,000 headstones, death feels at a remove. Perhaps this is why it is such a popular destination for families. Inscribed on the inner face of the colonnade: “THIS EMBATTLED SHORE, PORTAL OF FREEDOM, IS FOREVER HALLOWED BY THE IDEALS, THE VALOR AND THE SACRIFICES OF OUR FELLOW COUNTRYMEN.” This same sentiment is clearly echoed in the buildings, landscaping and layout of memorial. The subtext is clear one: “These people died for a great cause. What happened here mattered. Be aware and grateful.” In other wars the defeated sometimes make the same assertion but not in the losers of World War II. The wall that camouflages the cemetery abuts a small parking lot and has a single door only large enough for one person to walk through. The first thing you notice upon passing through the wall is how few headstones there are. 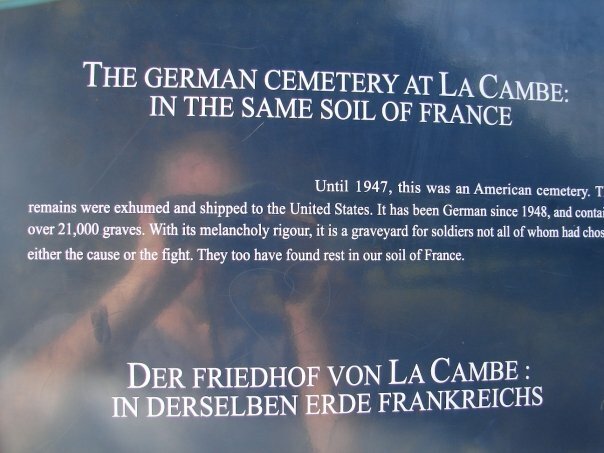 Although La Cambe contains more than twice as many bodies as the cemetery at Omaha Beach, it seems to have far fewer stone markers. This is in part because the tombstones lie flat on the ground and in part because many graves contain the remains of more than one soldier. Of the more than 21,000 bodies buried here some 13,000 are unidentified. At Omaha the number is 307. So the first thing you see when you look out at the burial grounds are groups of five dark crosses placed far from each other around the grounds. This gives the cemetery a solitary, isolated feel. Those crosses bring to mind small groups of people separated from each other by vast distances. It speaks of the loneliness and terror of combat; small numbers of soldiers, clinging to each other with no sense of being part of greater effort. The gravestones themselves fill the areas between the crosses so if you walk off the cemetery’s one path it seems as though you are on an ocean of the dead. 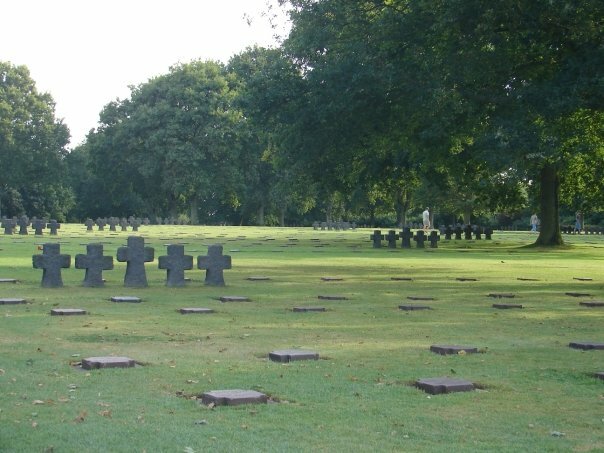 Wreaths from allied nations in the German cemetery. At the center of the graveyard a large stone cross sits atop a circular mound. The figures of a man and a woman with their heads bowed stand beneath the arms of the cross. The mound serves as a memorial to some 300 unknown soldiers buried beneath it. A stairway at the back makes it clear people are welcome to go up to the cross and look out. 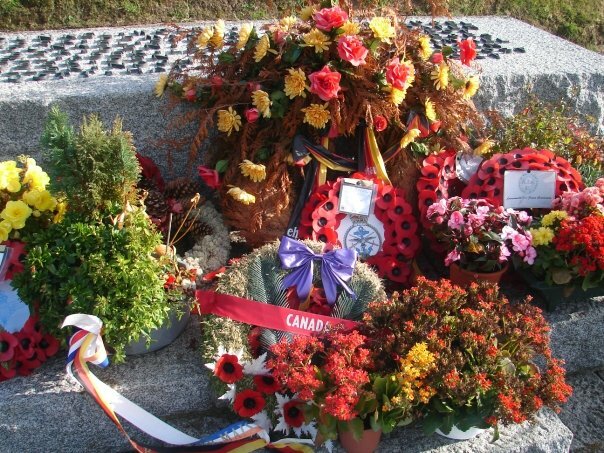 At the foot of the mound are a number of wreaths, many of them donated by former foes. If our Iraq and Afghanistan wars ever do end and thus are able to have monuments, what will they say? This entry was posted in Marketing and tagged Omaha Beach. Bookmark the permalink. did you ever have feedbacks on the red bull article? addressee, you must not disclose, copy or take any action in reliance of this transmission. If you have received this transmission in error, please notify us and delete the received data as soon as possible. This footnote also confirms that this email message has been swept for the presence of computer viruses. Thanks Jim! I never found a publisher for it so I figured I’d publish it myself.